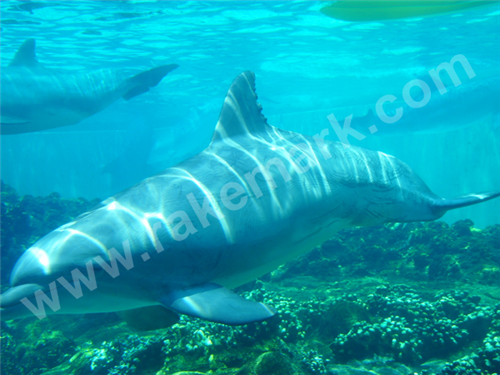 Rake Mark is definitely a distinctive company name and was founded over 10 years ago after a family holiday in Florida with the unique bottle nose Dolphins of Discovery Cove. Rakemark’s are sets of parallel scratches in the skin of a dolphin, which arise when dolphins fight, play and flirt with each other and are common especially in wild adult male dolphins. This picture was taken by myself (Sarah), whilst swimming with these stunning creatures and clearly shows the rakemark in all it’s glory. The rakemark’s are shallow enough to fade with time as new layers of skin grow, but show clear evidence that the dolphin’s are meeting and interacting with other dolphins. As these marks are created by the scraping of teeth on skin they are not uniform in any way and each and every dolphin will carry a different set of marks, making them individual and unique – just how we feel about our company and the service that we provide. We feel so passionate about our ‘Rake Mark’ that in 2011 we Trade Marked the name so that we can continue to remain unique.